NASA?s first live tweet-up between the public and astronautsin space was cut short Wednesday by a false alarm on the International SpaceStation. The station's two residentTwitterers - Nicole Stott and Jeff Williams - were mid-way through a liveinterview with a group of their Twitter followers gathered at NASA Headquartersin Washington, D.C., when they were interrupted by a loud beeping. "Excuse us just a second," Williams said as he andStott scrambled to check their consoles to investigate the source of the alarm.Soon after, the station passed out of communications range with groundstations, ending the live video link with the two astronauts. The alert came from a smoke alarm in the station'sRussian-built service module, but there was no actual cause for concern, NASAspokesperson Rob Navias said. "It was a false alarm," Navias told SPACE.com. The astronauts had been answering questions posed by membersof the public gathered for NASA's first ever tweetup - a meeting of Twitterfollowers - from space. Current and former astronauts also answeredquestions from Earth while waiting for the Earth-to-space video hookup. Over a million people follow one of NASA'saccounts on the microblogging site. 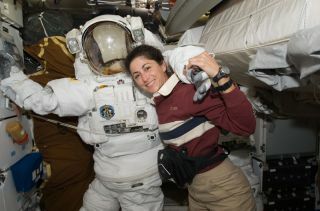 Williams and Stott both use the site to share snippets ofwhat life is like in space. Williams writes as "Astro_Jeff," whileStott posts under the name "Astro_Nicole." "I think we've shown here in the recent past that Twitteris an effective way to get the word out about what we're doing," Williamssaid today during the event. More fun for Twitter fans is coming up,when NASA plans to give 100 tweeps a tour of its Kennedy Space Center in CapeCanaveral, Fla., and a chance to watch the planned space shuttle launch on Nov.12. The tweetup was a chance for people to ask about some of theins and outs of life in space. A young woman named Sarah asked if there wasanything about living on the space station that the astronauts hadn't preparedor trained for. "Something you can't train for is how your body isgoing to react to the new environment," Stott said. "Getting used tomoving from one place to another without walking - just floating and pushingoff of surfaces? I think that has been a really cool part of this wholeexperience." A teacher from Rochester, New York, said his students wantedto know why they choose to be astronauts, given the risk. "I wouldn?t do this if I didn?t think it was[important]," Stott said. "I have a family at home, I have a youngson. I truly believe that what we're doing up here is opening up new opportunitiesfor him as well as for the rest of the world." After the spaceflyers were cut off by the false alarm, NASAtransitioned the event to the ground, where people could ask questions ofastronaut Michael Fincke, who recently returned from a long-duration stint onthe space station, as well as former astronaut Tom Jones. Jones said the alarm wasn't all that uncommon, but that theastronauts still needed to diligently check it out. "Every couple of days you're going to get something likethat," he said, when a sensor reads a slightly higher or lower thanexpected level of cabin pressure, instrument voltage, or something similar. NASA capped off the event by playing the song"Stargirl" by McFly, which NASA spokesman John Yembrick said manyTwitter followers requested they play on the space station, because itsspace-related lyrics are so fitting. "This is dedicated to all of our McFly fans that arefollowing us at NASA," Yembrick said.